A woman who has fallen in love with God will sometimes start laughing during Mass for no real reason… or she might start crying instead. She might write long journal entries in praise of God, or secretly arrange a towel around her head to see what she would look like in a veil. The beginning of discernment can be an incredible time to be alive, an experience of heady, overwhelming love. Like Mary, the young woman who has drawn the attention of God can only stand still in amazement, and ask, “How can this be?” Her awe and gratitude become a song of joy: My soul glorifies the Lord, and my Spirit rejoices in God my Saviour. He looks on His servant in her lowliness; henceforth all ages will call me blessed. It would be wonderful to be able to rewind to that stage of discernment, to be that achingly young and hopeful person again even for a little while. 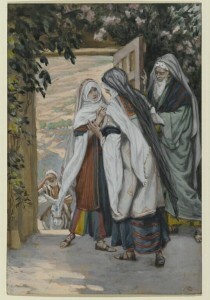 But instead, women who have left the convent have followed Mary’s journey far past that point: the joyful anticipation in those early days became the Nativity, as all that we longed for was gathered into our arms for the first time, and slowly, the path led from there to the foot of Calvary. 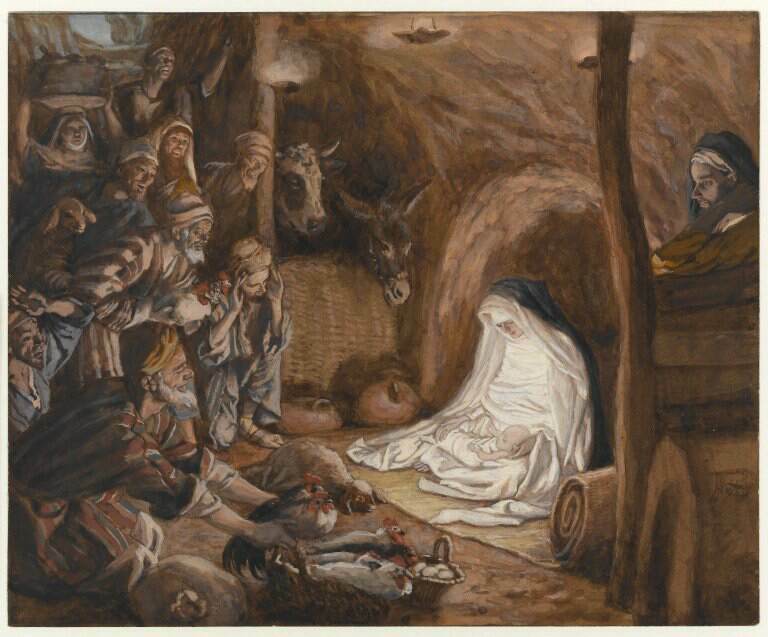 Christ vanished into darkness, and a stone was rolled over the tomb. As night fell early, she went home to wait for morning, and so have we. We know how this story ends, however… He returned to her, as He is quietly coming back to us. If we had remained in the innocent happiness of the Annunciation, we would never grow wise enough to share His suffering, and one day witness the Resurrection. Discerning a vocation can be immensely lonely: imagine a tidal wave going through your soul, sweeping away familiar landmarks and permanently changing the face of the world, and then imagine that everyone else insists that the tidal wave is just a figment of your imagination. Mary kept her secret close for the same reason: who would have understood the mysterious way in which God has spoken to her, let alone a pregnancy with such an implausible explanation? In those early days, not even her gentle, protective fiance could share that knowledge with her. Instead, she “arose, and went in haste to the hill country” to find her cousin, the one person who might understand. At last, someone had seen what Mary saw, and spoken aloud what she had treasured silently in her heart! In order to discern the religious life, I had to develop a level of spiritual self-sufficiency and learn to persevere despite what others told me. Looking back, I consider this vital training for the time just after I returned to the world, in which people who loved me were celebrating the exact same thing I grieved. I was used to the difference by then, so it didn’t trouble me as much as it could have. And yet, the Mystery of the Visitation teaches us that God doesn’t expect us to go it alone, like Mary, we can and should seek support and understanding from others. I also find it comforting to know that if, one day when I am older, I meet a young woman who has left the convent and is grieving, I will be the one who knows what to say to her. Today, it’s easiest to empathise with Mary in her search for love and encouragement: in the future, perhaps, God will give those of us who have left the religious life the place of Elizabeth in another’s story. Out of interest, I recently added up the number of times that I’ve changed address in the last five years. Short-lived share-house arrangements, temporary returns to live with family when said share-house arrangements fell through, and, of course, a move into and out of a convent, brought the total to eight. It struck me that the early years of Our Lord’s life were marked by a similar pattern of change: from Nazareth to Bethlehem, and from there to Egypt, and then back to Nazareth again a few years later. Mary must have craved a quiet place to settle with her baby, and Saint Joseph would have felt the strain of keeping his family safe in a new location every time they were uprooted. And yet, nothing happened at random: every stage of their journey was part of the Father’s plan. 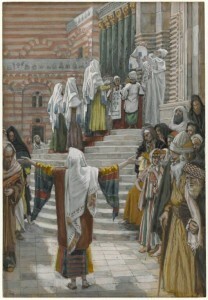 “He remained there until the death of Herod. This was to fulfil what had been spoken by the Lord through the prophet: out of Egypt I called my son” (Matthew 2:15). The Presentation is the fourth Joyful Mystery of the Rosary, but also the first of the Seven Sorrows of Mary: a sign of the complexity of the lives that real people live. The intertwining of joy and sorrow will be familiar to any who have lived in a religious community, family and friends may be sympathetic, but it’s still impossible to explain to them the way that religious life can raise the soul to breathtaking heights and in the same instant crush it to powder. The prayer of Simeon over the infant Jesus was a moment like this for Our Lady. 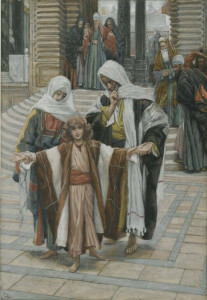 Her triumphant words in the Magnificat “He casts the mighty from their thrones and raises the lowly” were confirmed by the old priest’s blessing, but then it came, almost as an afterthought: “and a sword shall pierce your own heart also.” Although God had blessed Mary above all women, His blessing was not insulation against suffering, and Simeon’s words laid out before her eyes the intricate tapestry of joy and sorrow that would be woven throughout her life. After I left the convent, the blessings and sufferings of life in the world felt bland in comparison with those I had experienced in the religious life, and I resigned myself to a life of numbness. I’ve now begun to see instead that the same tapestry is still there before me, being unfolded day by day. The pattern may have changed since I was in the convent, but the will of God is still weaving my future. Like the Presentation yesterday, this story from the life of Christ appears in both the Joyful Mysteries and the Seven Sorrows. 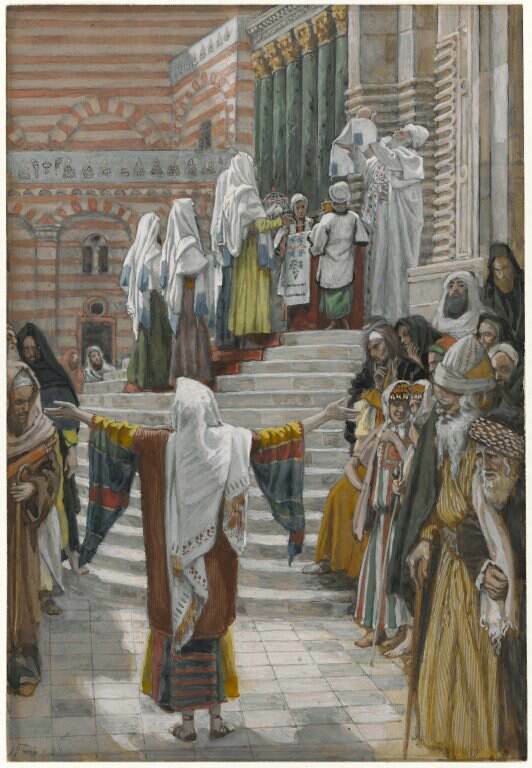 Imagine Mary as a young woman wandering the streets of Jerusalem, calling out to Jesus over and over, and receiving no reply. The sun sets, and rises, and sets again, and still He is not there. We have felt this urgent sense of loss, too. The worst part of grief is not sorrow for the past, but fear for the future: will I ever succeed? Will I be happy someday? Will I recover the relationship with Jesus that I had before I entered the convent? So we call Him, over and over. The sun sets, and rises, and sets again. Will we ever find Him? We may, by faith if not by sight. He waited for Mary and Joseph in the Temple, as He waits for us in the Tabernacle, and He is about His Father’s business, interceding for us before the Throne in heaven (Romans 8:34). The Godhead is here, in hiding. Because He is hidden from our sight, we cannot fling our arms around Him, as they did, and cry, “We have been anxiously searching for You!” (If we could, we would probably receive the same puzzled enquiry about why we were anxious when He had been here the whole time.) The greatest longing is not now to find Jesus, for we know where He is, but to see Him where He waits, and one day, that faith will be rewarded when the veil between heaven and earth disappears.